In a word; WOW! This beer, at almost $9 for a 12 oz. bottle, is absolutely worth the price, and you'd be hard-pressed to say that many beers are worth almost $1 per ounce. Into a snifter, it pours a dark brown, muddy color with virtually no head, but what there is for head is a dark brown color as well. Fair lacing. Immediately, the aroma is of sweet malts and alcohol, but a closer sniff reveals a red licorice scent, likened to Twizzlers. Initial taste is heavy sweet, although not so much that it put us off. 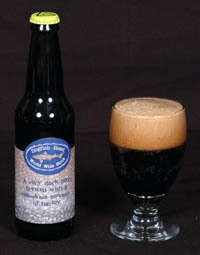 Mild charcoal bitterness at the finish, with a nutty, roasted malt taste. Thankfully, there was a long duration on the mouth. Medium bodied, it tickles the tongue on the finish. Oily consistency, yet left us dry with a light to medium alcohol feel. Phenomenal beer, best we've had in a long, long time. Reviewed on October 26, 2006.